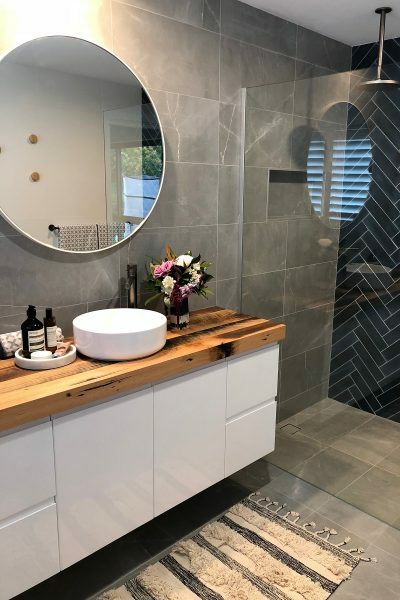 Designing a small bathroom can be a tricky challenge. 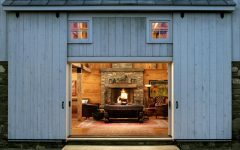 How can you deliver the mood, ambiance, and impact you want to convey in such a small space? 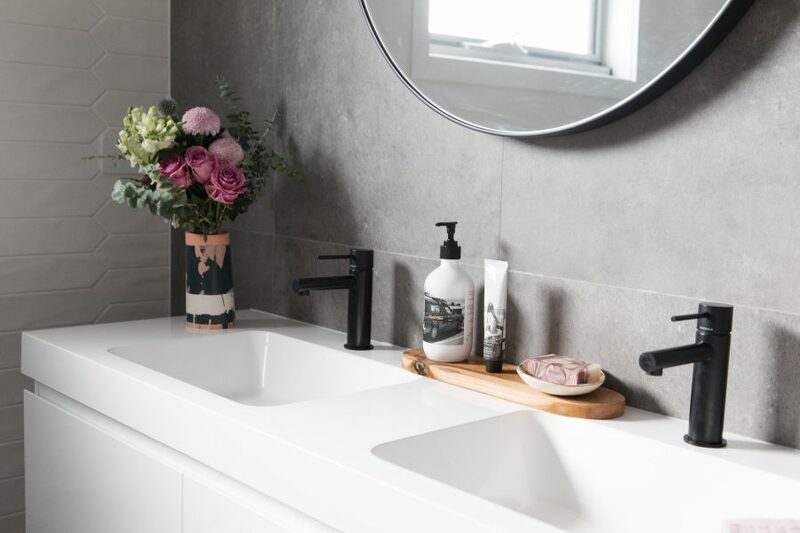 Here are 4 must-have pieces for every small bathroom, featuring work by interior design firm Studio Black Interiors and builders Homes by Howe and REP Building. 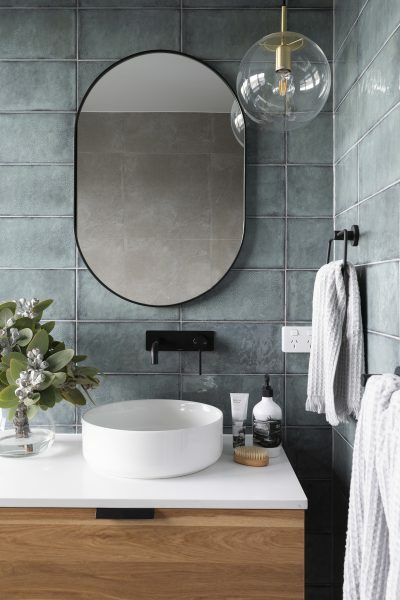 A round mirror is ideal in a small bathroom because they have softer edges and have a lower profile than square/rectangular mirrors. 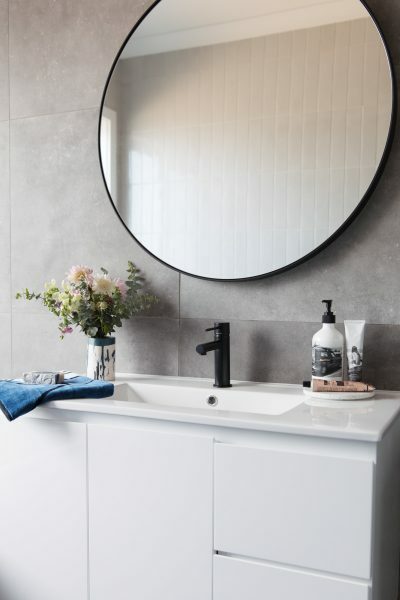 We went with a round mirror in all of our bathrooms because round mirrors bring softness to modern bathrooms which typically feature hard surfaces and clean lines. 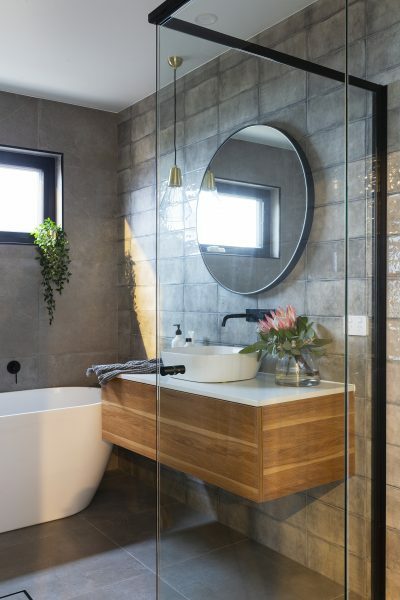 The mirrors truly play a big role in making these rooms seem less serious and more warm and relaxed. 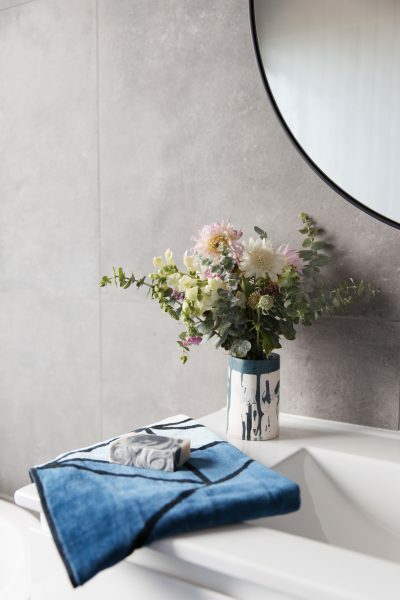 I love using organic shaped mirrors in bathrooms because they bring a lovely organic feel to a space and break up the hard finishes of tiles and bathroom fixtures. In this bathroom, we went with a warm floating vanity with cute vessel sinks on top and a beautiful glossy tile behind it. 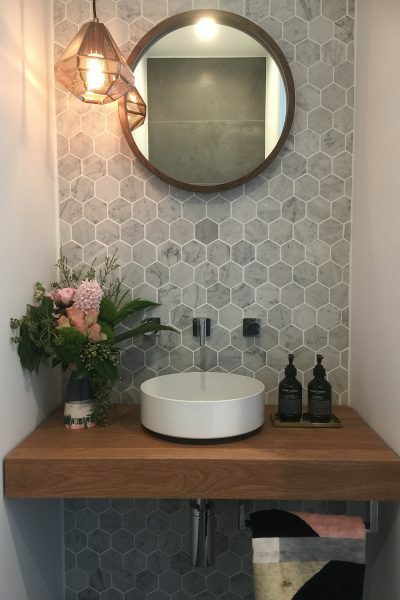 The round mirrors allowed us to have two mirrors for this double vanity without overpowering the wall with a huge mirror. 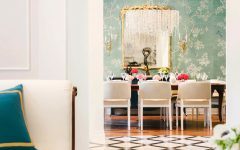 The bubble-like sconces are a fun and whimsical addition that give an understated impact. 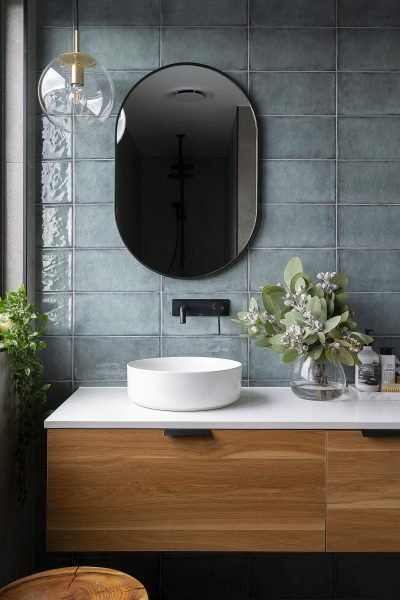 These minimalistic round mirrors are perfect to complete the look of these contemporary spaces. 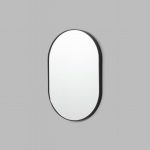 The wooden mirrors feature a soft painted matte finish and slim profile. 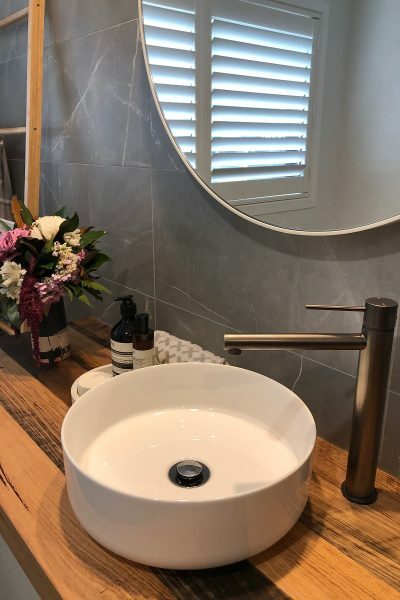 The round mirrors perfectly compliment the round vessel sinks because they’re scaled and sized nicely. 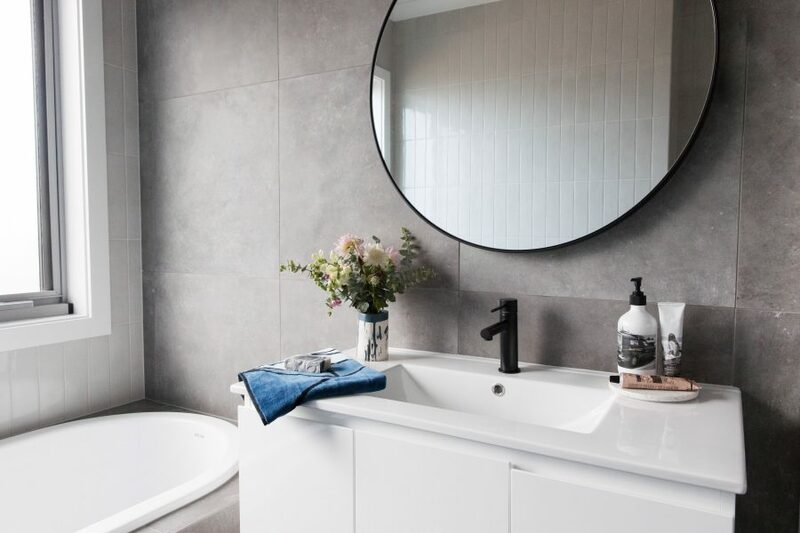 Keep in mind that most decorative mirrors are warrantied for bathrooms, which means you may need to replace it every 5 years. 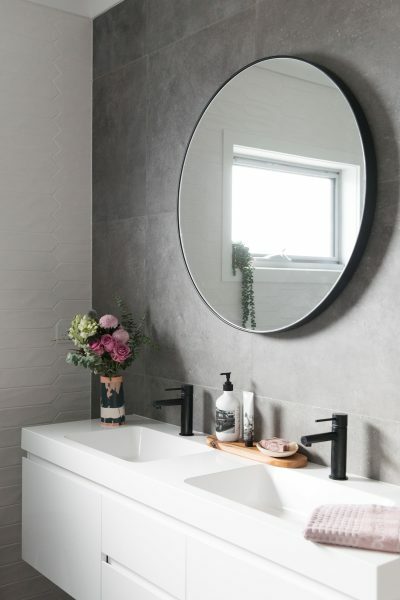 Round mirrors also allow for more negative space with their curved edges, which is great when you want to show off walls — the walls behind these mirrors feature a beautiful tile that makes a statement on its own, so we definitely wanted to highlight them. 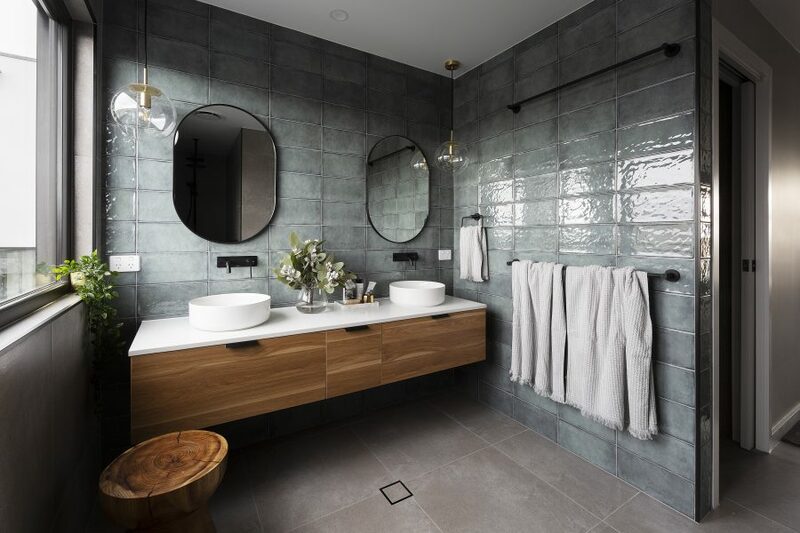 Because the mirrors don’t take up the whole wall, it allows the gorgeous tiles behind them to still be a showstopping feature. 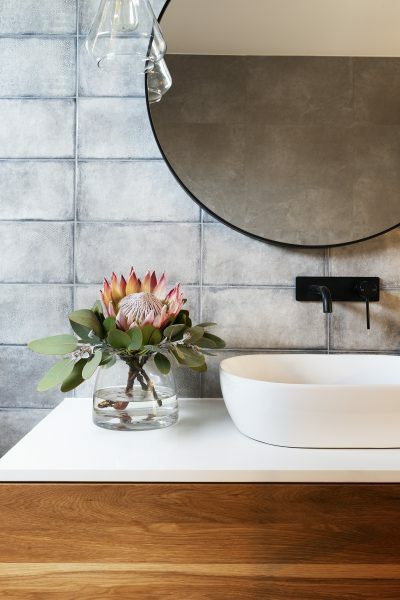 This bathroom features many of the same design concepts as the master bath — the floating vanity, the vessel sink and sleek hardware, the round mirror, and bubble-like sconces. We used a glass shower to really open up the space and maximize flow. 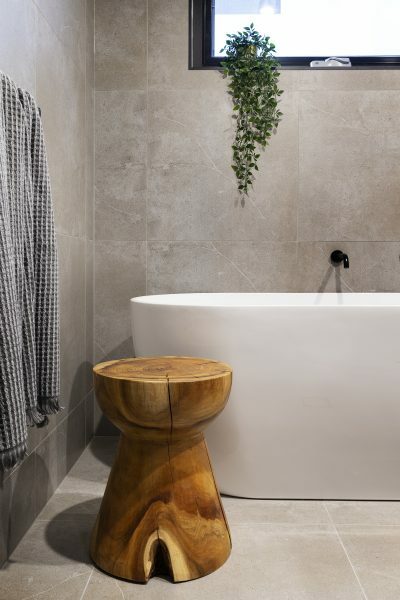 The concrete and minimal hardware really highlights the free-standing tub, which we wanted to be the focal point of the room. 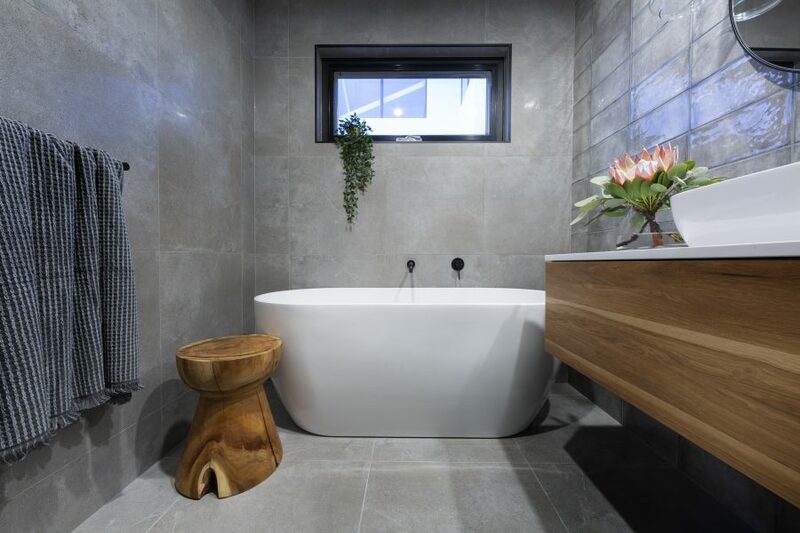 Overlooking a picturesque valley, the design of the bathrooms in this home were all about capturing the feeling of tranquility and serenity, with a touch of moodiness. 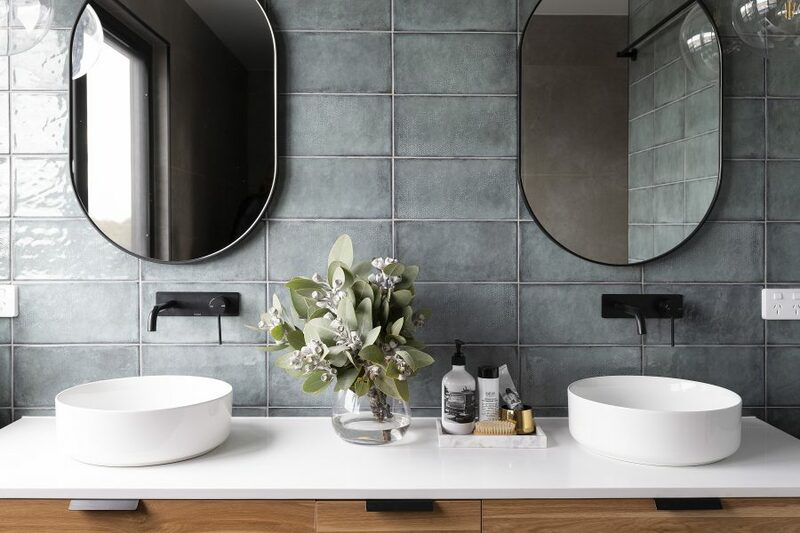 Spanning three floors, all of the bathrooms in this home are connected and cohesive through a unifying gray palette and pops of black accents. 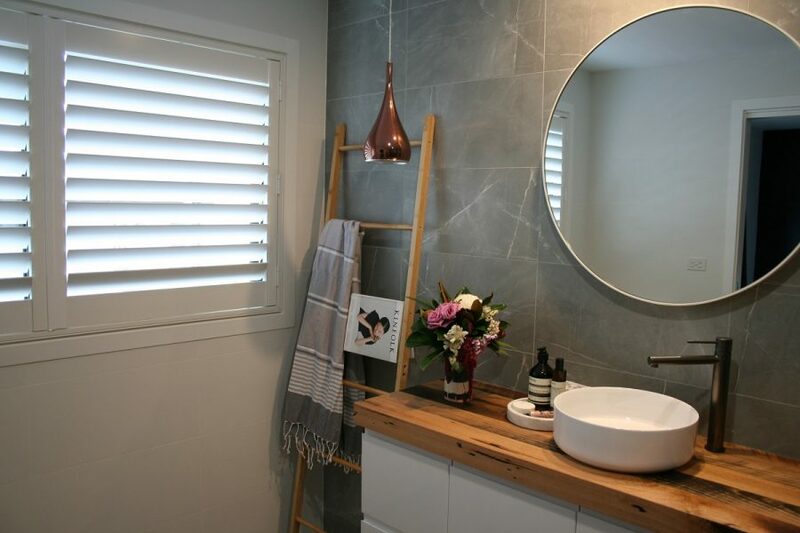 In a small bathroom, a piece that typically takes up the most space is the bathroom vanity. 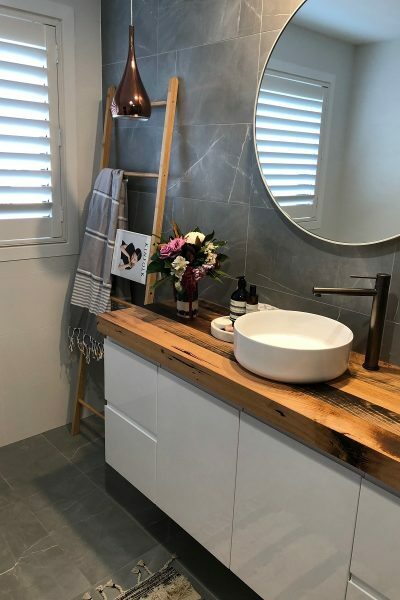 While you can opt for a smaller vanity that has a smaller footprint, like vanities with no storage, going for a minimalist vanity will also do the trick. 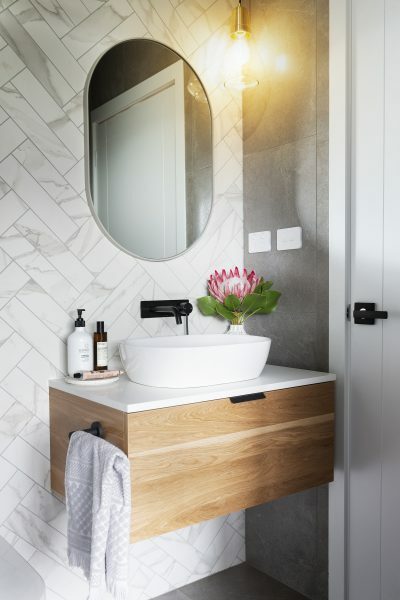 This vanity is great for a small bathroom because its white palette, clean lines, and lack of hardware and cabinet pulls make for a sleek design while providing you with much-needed storage. This vanity pulls off a double vanity without looking cluttered or crowded! 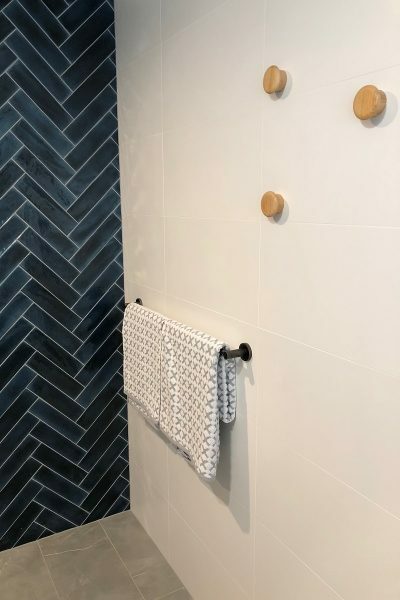 For this new family home, the interior design aesthetic for the bathroom and ensuite was modern neutrals. Lots of bold charcoals, black, pale grays, and whites. A sophisticated and timeless palette. Because we used similar vanities, mirrors, and hardware, the two bathrooms really feel like extensions of one another. 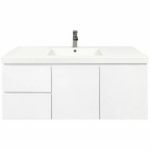 An integrated sink with your vanity top is a smart design that looks great and is also very functional. With a seamless finish and clean understated lines, an integrated sink ensures that you’ll never have any dirt build-up again! 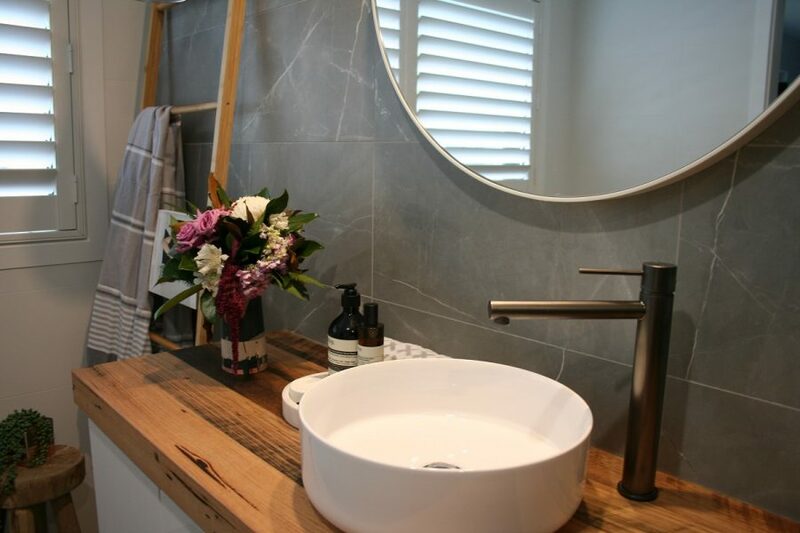 Poly-marble vanity tops are moulded and then coated with a durable classy coating that’s durable and strong. The downside to a poly-marble surface is that it is susceptible to heat damage, so watch those hot curling wands! 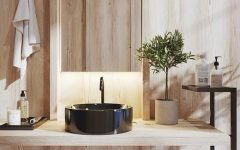 When designing a small bathroom, you have to rely on subtle features to deliver luxury and elegance. 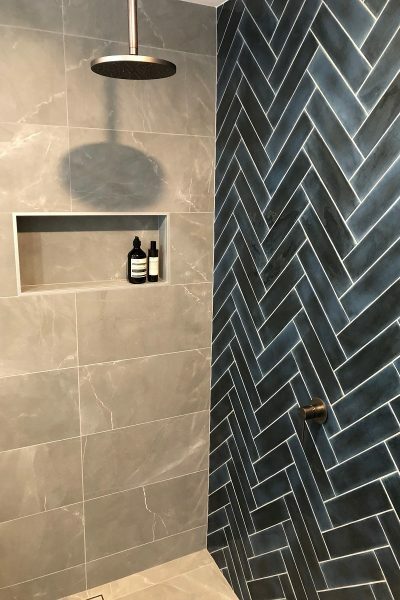 A tile is the perfect way to do that; you can utilize the tile to create impact in your bathroom, whether through the pattern, texture/material, or color. 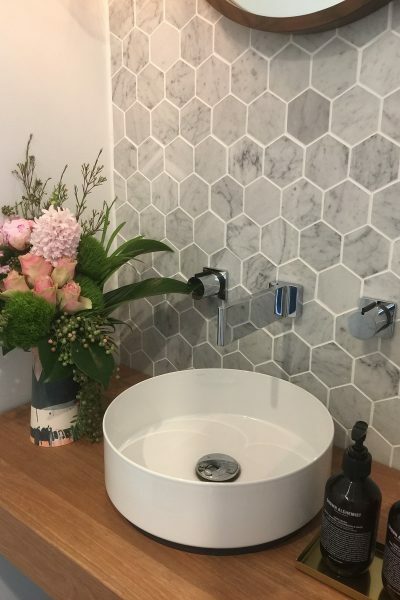 In this tiny powder room, I’ve included a wall of Carrara marble hexagon tiles; these little beauties are luxurious, sophisticated, and timeless. 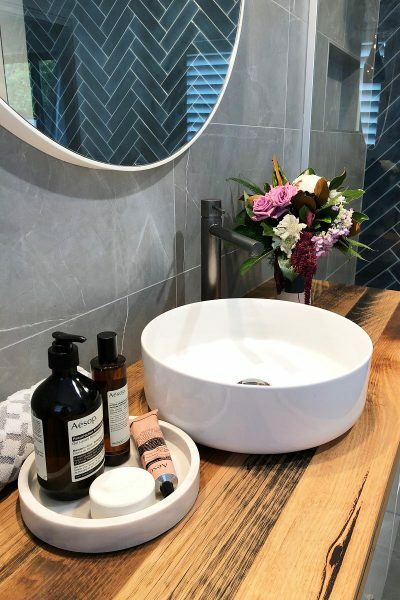 The lovely pattern, veining, and natural movement, paired with the timber floating vanity, shows that even a small space can pack a punch with the right products. 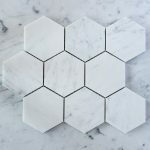 However, keep in mind that marble is naturally porous, and so it tends to absorb stains and water and it is important to seal it. The brief for this little powder room was to use timeless materials to create a space that was luxurious but full of warmth. 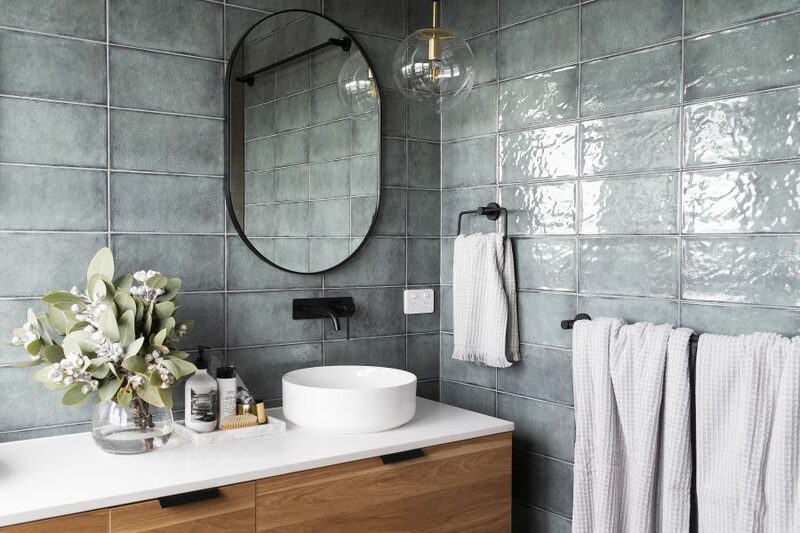 In a small powder room like this one, you want to rely on textures, materials, and subtle details to create a large impact. In a small bathroom, sleek hardware is your best friend. Their low profile is sleek, modern, and sophisticated. ProHINT: When going with a vessel sink, using sleek hardware is a fool-proof way to ensure that your hardware doesn’t clash with your sink. 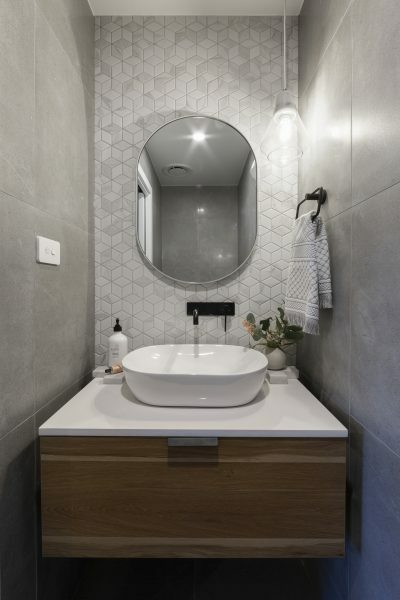 In this bathroom, we went with a round mirror to show off the gorgeous tile and to play nicely with the rounded edges of the vessel sink. The wood countertop added much-needed warmth to this cool palette, which was lacking a wood finish. 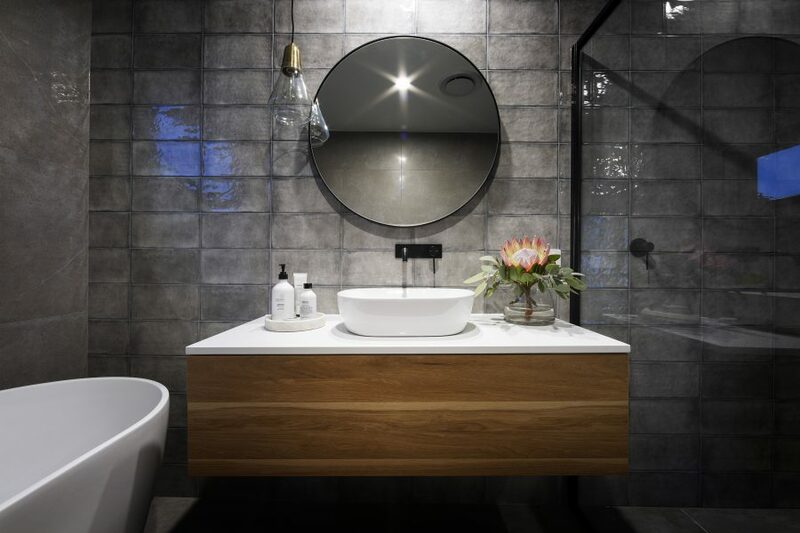 This ensuite was all about mixing different finishes to create a modern space that also felt warm and inviting. 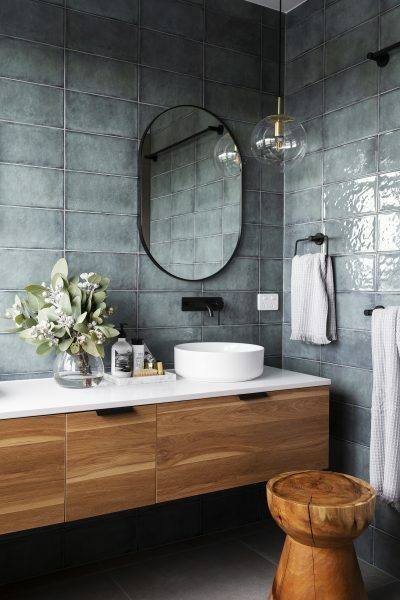 From the recycled timber vanity top, metallic tap wear, and the deep jade blue herringbone tiles, this ensuite is a space to enjoy. Not so long ago, chrome was essentially the only bathroom tapware finish available. 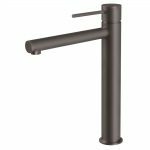 Now, there are a range of metallic tapware finishes that can really make your bathroom feel special. 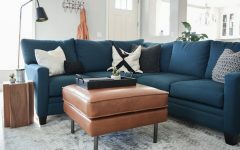 Metallic colors are renowned for adding warmth to a space. 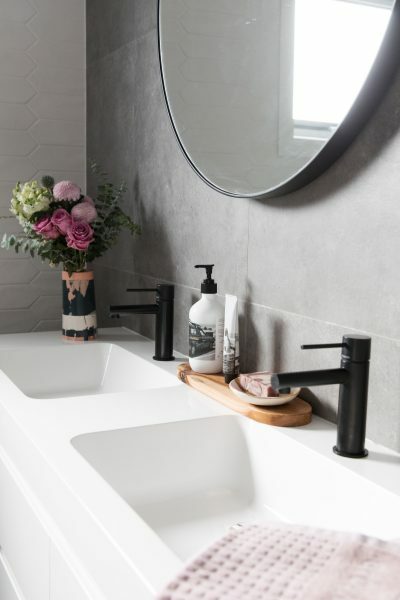 Warm metallic tones such as this basin tap in a gunmetal finish looks great paired with a recycled timber vanity top. Gunmetal has a smooth metallic luster, almost a dark warm gray in color. However, a metallic finish is a very specific look and can lose its lustre over time. I am a little obsessed with interiors. Born to a commercial builder and a very stylish mama, building and style are in my genes. 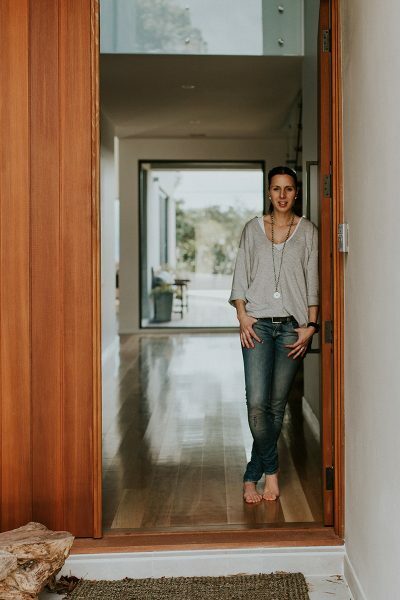 Having worked for over 17 years in advertising and marketing, I now combine this experience with my passion for interiors, styling, homewares, renovation and design. I am a qualified Interior Decorator and have recently completed a Diploma of Interior Design. 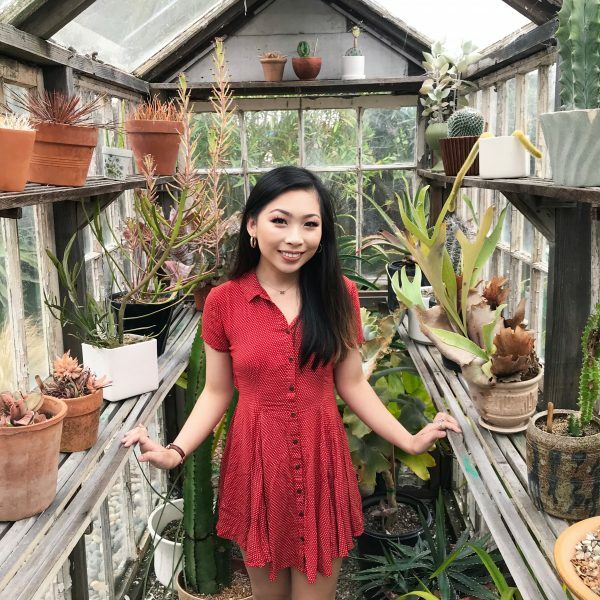 Recognizing that decorating a room can often be daunting, I offer a one-on-one personalized service to create your dream space. For more information, visit studioblack.com.au.